She might be training Farnese, although what the apple will be used for in the training is hard to see at the moment ;D. That's the first thing that came to my mind, though. She's training Farnese how to make apples put beautiful young women to sleep...the only drawback is that a kiss from a prince can break the spell. Left bubble: ...but to magic-users, it can be recognized as an eminent spirit that controls human indigestion. In all seriousness, I can't even begin to guess what she's on about. When do we get a chapter title? It's the name of Farnazze's family. looks like Farnazze's dad might play a role in this part. Well I guess that means the Chapter of Falconia isn't over yet...oh well, it sounds interesting. Thanks Saiki ;D.
Yeah the chapter of Falconia is far from over or...? The chapter isn't over yet (obviously), would have been a bit short and abrupt to end it now anyway. I wonder where this information came from though, as it had spread on Japanese fan sites. Correct spelling might be "Vandimion" I think, not sure though. As usual, the preview doesn't tell us much, but we may learn more about what the Holy See is planning to do concerning Griffith and the Kushan invasion. I wonder where the "rumor" came from though, as it had spread on Japanese fan sites. I don't know anything about Japanese language, obviously, but on ya.com it said 新章スタート for ep 250, so maybe that's why? Babelfish tells me this means "new chapter start", though I don't know if that's very accurate or not. I don't know anything about Japanese language, obviously, but on ya.com it said 新章スタート for ep 250, so maybe that's why? Uhh yeah, now that you mention it, I'm pretty sure that's what my wife had told me 10 days ago when I asked the exact same question, while I had seen it on the site already (I need vacations ¬_¬). Guess I'm going to be yelled at tonight. I don't think it's because of Babelfish. It's from YA's announcement. I checked several Japanese sites where it was said like that. I guess it's because YA announcement confused us, Japanese people included. It might mean "upcoming thing" or "we are getting into the new chapter" but we took it as an info about the episode 250. Maybe they should have added such important two words "so soon" at the end of the announcement "New chapter starts! ", not to confuse millions of readers. I checked some source now. The webmaster showed an unpleasant feeling about the YA's announcement saying " Falconia continues. There's no new chapter in this episode.This kind of thing happened before though I wouldn't say it's too much...". I always thought that "Falconia" is the realization of Griffith's dream, his own kingdom within his hands. As far as I know, Falconia's supposed to be a city (city of the Falcon). And the way I take it, it'll be the capital of Griffith's future Kingdom. Whether he will rename Wyndham or Vritannis or whatever, I don't know. Of course not... Did I really need to answer? Anyway, since this seems to have started a flurry of posts dedicated to edited pictures, I ended up splitting the thread so it wouldn't be chaotic. For further edited pictures related posts, go there: http://www.skullknight.net/yabbse/index.php?topic=4135.0. Let's get back on topic now please. I will suggest the outrageously unbelievable possibility that the apple is, in fact, perfectly normal apple with no gimmicks involved. If darkbane's prediction about Azan appearing to tell the Guts&co. 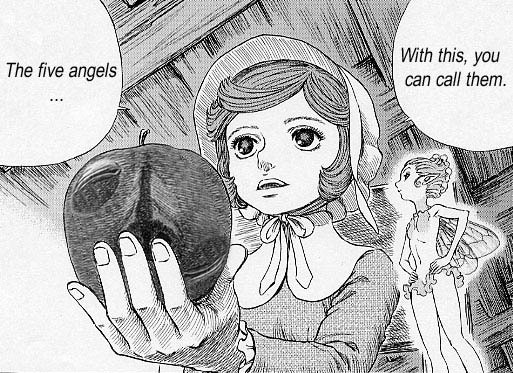 news about Farnese's family proves to be correct, then it might be that Schierke is offering the apple to him. ...and whatever it is, a new episode of Berserk is always good. Especially after a pause like this. Regardless when the new Chapter begins or not. Happy to see that the next episode will be Friday. If the chapter of Falconia is ending soon, does that mean that Griffith will soon establish it. I am curious to see how much will be revealed to Farnese, and whether or not she will soon know the truth about Serpico. I think this is gonna be another story advancement episode with the Kushan arriving at the end of it. I think this will be a long chapter... like the previous chapter of the Record of the Holy Evil War... It last about 6 volumes. Aaz, aren't you being a bit overzealous when you edit almost every post in this thread alone? It's pretty annoying.